It’s generally accepted that charcoal grillers and natural gas grillers are going to agree to disagree on which fuel method produces the best bbq. The purist of barbecue masters will argue that you don’t get the same flavor from natural gas grills compared to a high quality charcoal grill. At the same time, grilling with gas gives you excellent temperature control, less ash & debris and a high quality heat source. Personally, I like both depending on what I’m going to be grilling. There are about as many charcoal grill & bbq options as there are options for natural & propane barbecues. Here’s a quick comparison table I put together with the top features from each of the barbecue’s that made the “best of” list. While the Weber Original Kettle Premium Charcoal Grill looks like a blast from the past, it is full of modern flair and integrity. This 22-inch diameter barbecue features a porcelain-enameled bowl, which lends well to the vintage look of this barbecue. You’ll have lots of room to cook up some burgers and steaks on the cooking grate that measures over 360 square inches. What’s great about this one, besides its excellent design, is the one-touch cleaning system that allows you to clean the entire thing without lifting a finger. 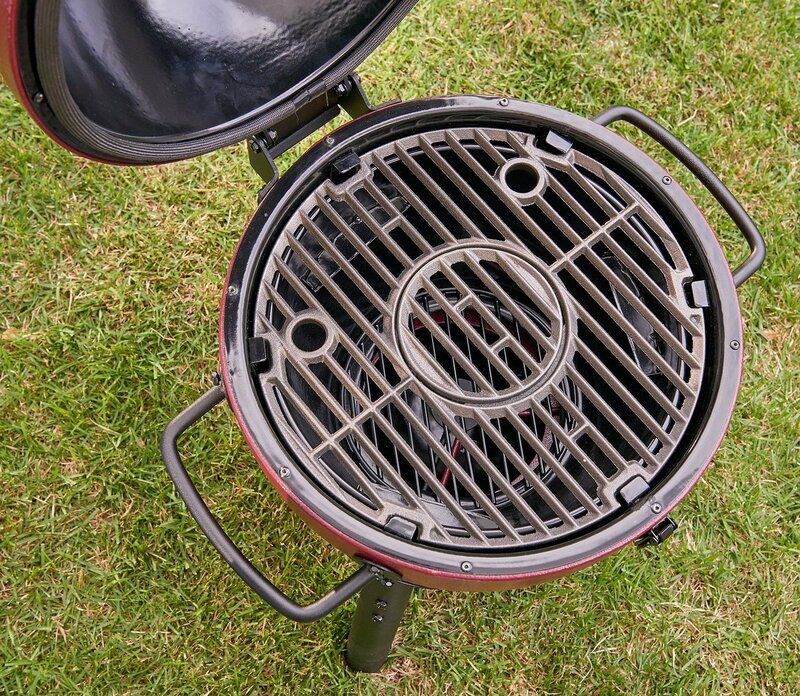 There is a high-capacity ash catcher that stops your the bbq from leaving a mess behind after it has been cleaned. Just remove the tray, and you are on your way to your next meal clean and ready to go. The aluminum damper means you’ll stay safe from flame and heat when you adjust your settings, and the glass-reinforced nylon handles make it easy to move wherever the party is happening. When put together, the unit measures about 38 inches by 27 inches by 22 inches. It’s an ideal size for backyard barbecues, events, parties, and you could even take the legs off it and throw it in the camper for a weekend away. 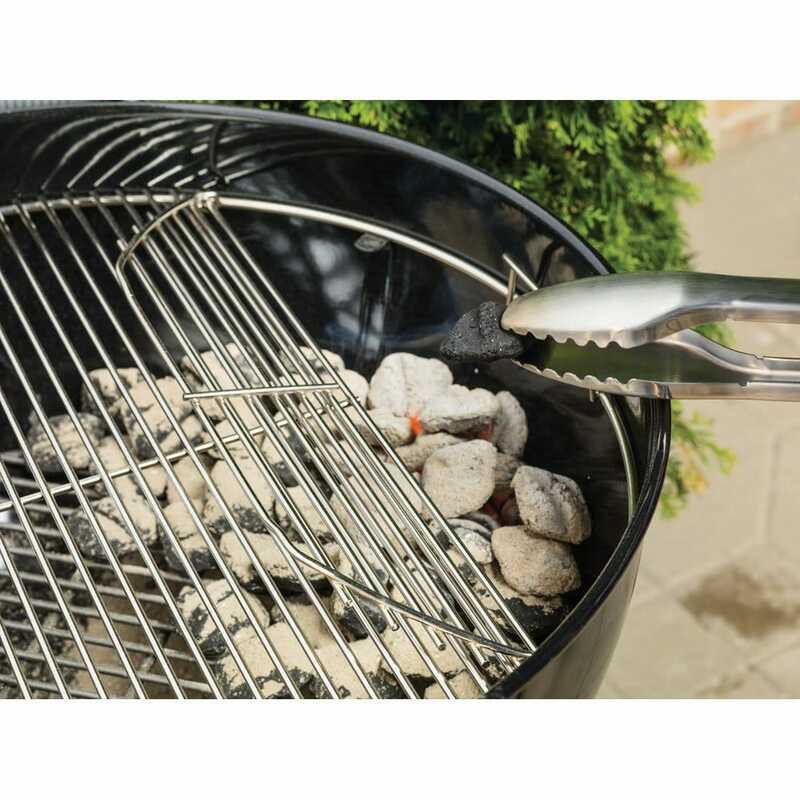 This charcoal bbq is easy to use, and the built-in thermometer makes it easy to know when it has reached the perfect temperature to cook your food. It only takes a few minutes to assemble and it’s great for cooking both meat and vegetables. You can even grill pizzas and fruits for that fire-roasted flavor. Charcoal bbq’s are easy to use and provide a nostalgic experience for people who love to cook with charcoal. While propane and natural gas bbqs are all the rage, there are still quite a few people who love the smell and taste of charcoal cooking. The Weber Original Kettle Premium grill is for you if you like cooking with charcoal. If you are looking for a dual performance grille, then the Weber Performer Deluxe Charcoal Grill is for you. 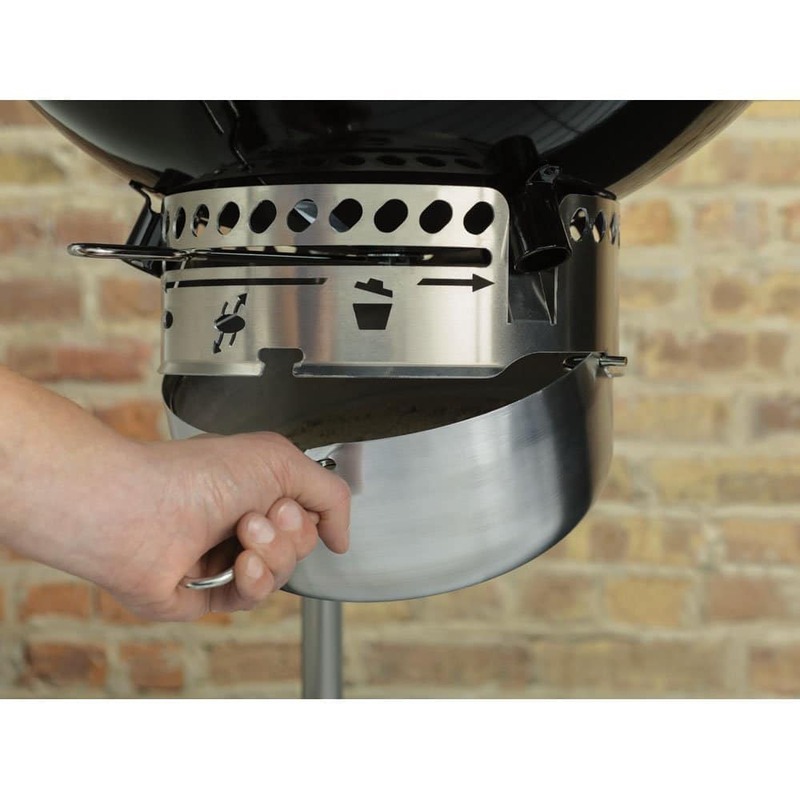 This unit features a gas ignition system that will heat the charcoals quickly and efficiently. 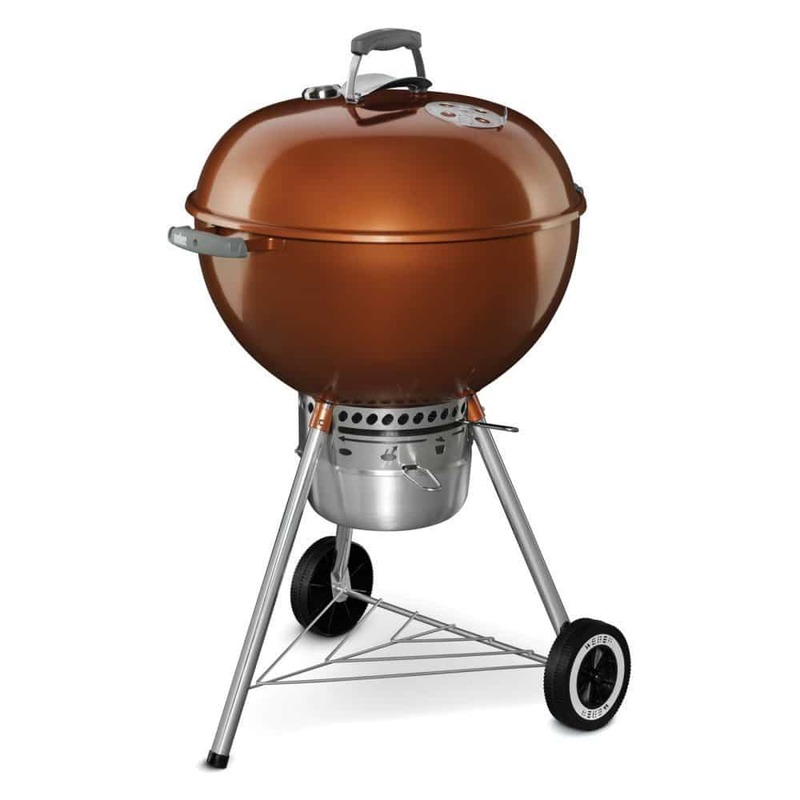 The bbq itself measures 22 inches in diameter and offers about 360 square inches of cooking surface. That’s a perfect size for most day-to-day grilling needs. 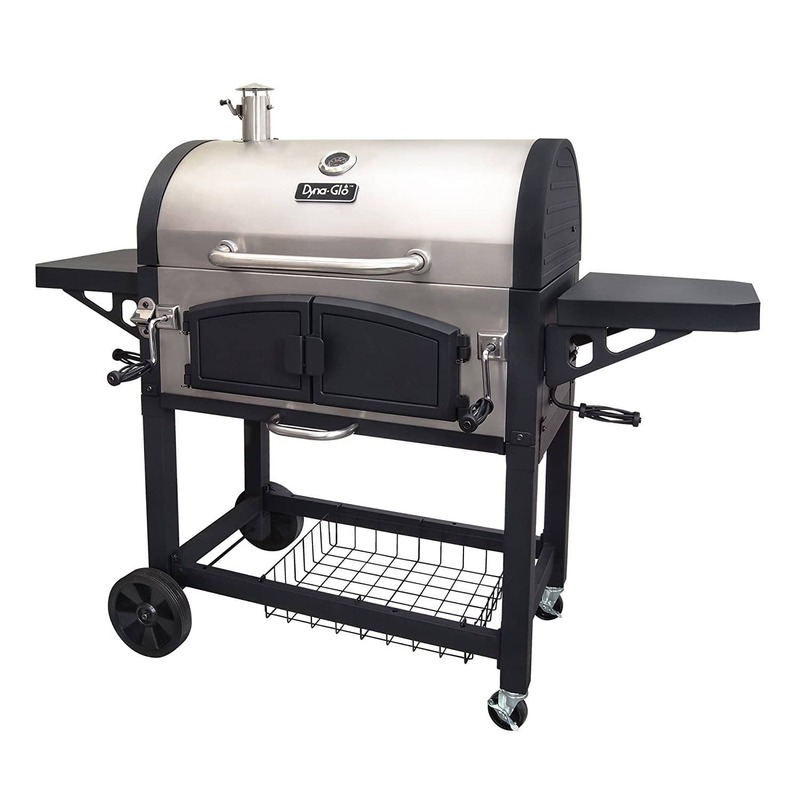 This Weber has many of the standard features that Weber grilles offer including high-capacity aluminum ash catchers and one-touch cleaning systems. There’s also a built-in thermometer so you can see how the temperature is faring during your cooking. After all, ensuring the heat stays inside is essential to get your meat cooked just right. 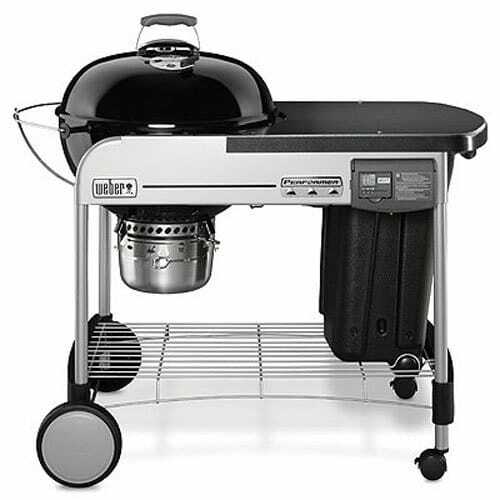 When it is assembled, this Weber is much larger than other Weber’s, measuring about 43 inches by 48 inches by 30 inches. 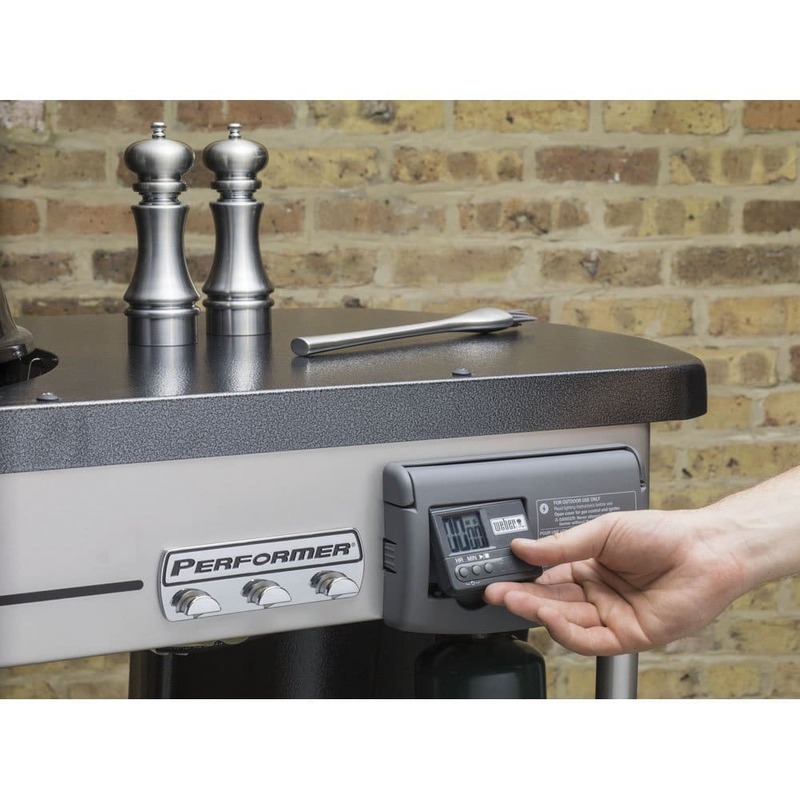 Weber is known for its world-class bbq’s, and this model features an LCD cooking timer that allows you to see how much time is left on your feast. This one doesn’t look like a traditional Weber grill because of the large chassis that it sits in, but you can rest easy knowing you are getting superior Weber performance and value in this great grill. There’s lots of space to do prep and even store barbecuing utensils when you aren’t using the grill. It’s easy to move when you have two people, and you’ll find that cleaning is a breeze. You’ll only need a small cylinder of gas to ignite the flames for this grill. 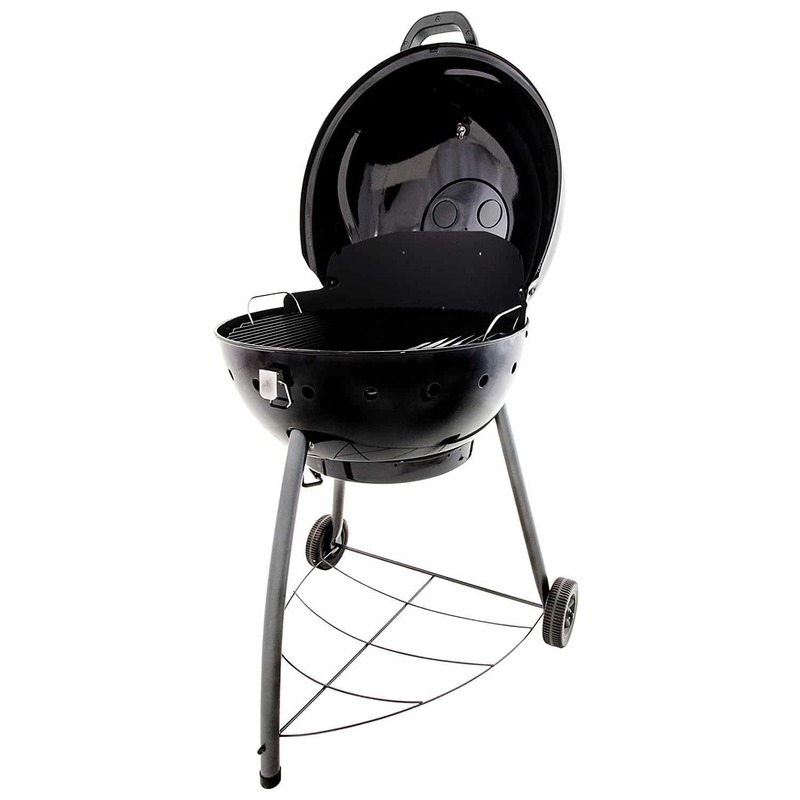 The handle is reinforced with glass, and there’s even a storage bin for charcoal when you need to top up as you grill. The design is classic yet modern, and everyone will love using this bbq to prepare a meal on a summer’s day. This is an excellent option for families or people who like to cook outdoors and want prep and storage space while they work. Char-Broil has deemed this unit the ultimate backyard grilling machine. But does it stand up to that reputation? 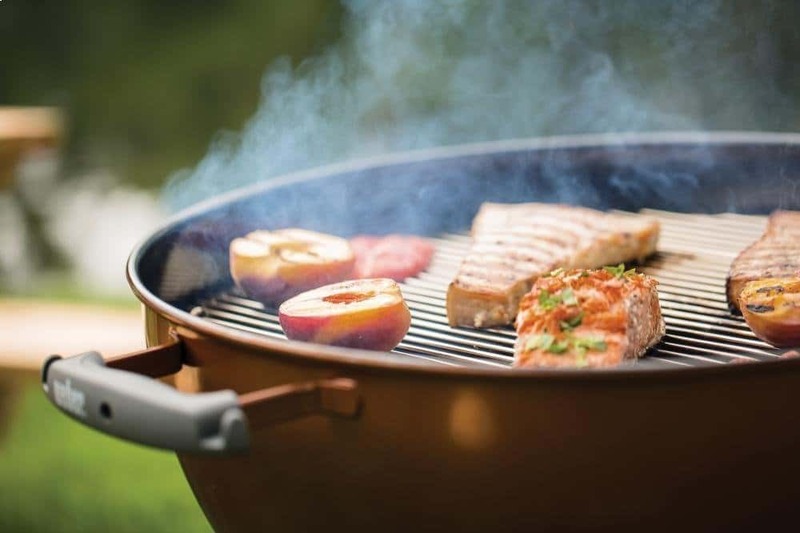 It offers a 360 square inch cooking surface – which seems to be pretty standard across the board when it comes to backyard grills that use charcoal. It looks great and has a sleek black design that would look good in any backyard or on any patio. The domed hood is porcelain-coated to protect it from the elements, so you don’t need to worry about leaving this it outside for a few days at a time. It’s always best to have a cover, but this is a sturdy bbq that can handle some nights in the rain. The hinged lid makes it easy to check on your food as it’s cooking without feeling like you have to find somewhere to rest the cover, like some other models on the market. It comes with a 10-year limited warranty and the vents on the lid help to keep the heat in and cold out. Char-Broil makes sure your meal turns out great each and every time you fire it up. It is extremely easy to move and is small enough to store in a garage or basement when not in use during the colder weather. While this is a charcoal grill, Char-Broil has worked to improve the way it functions, and you’ll find you won’t need as much charcoal compared to other similar style barbecues. They use infrared technology to help the grates heat up faster and retain more heat so that you don’t have to keep worrying about the temperature inside the unit. It’s a very modern technology wrapped up in a vintage looking grill. As if this grill couldn’t get any better, it comes with 3 wheels that makes it easy to move it around from place to place. There’s even a small storage shelf on the bottom to house your tools, towels, or beer. 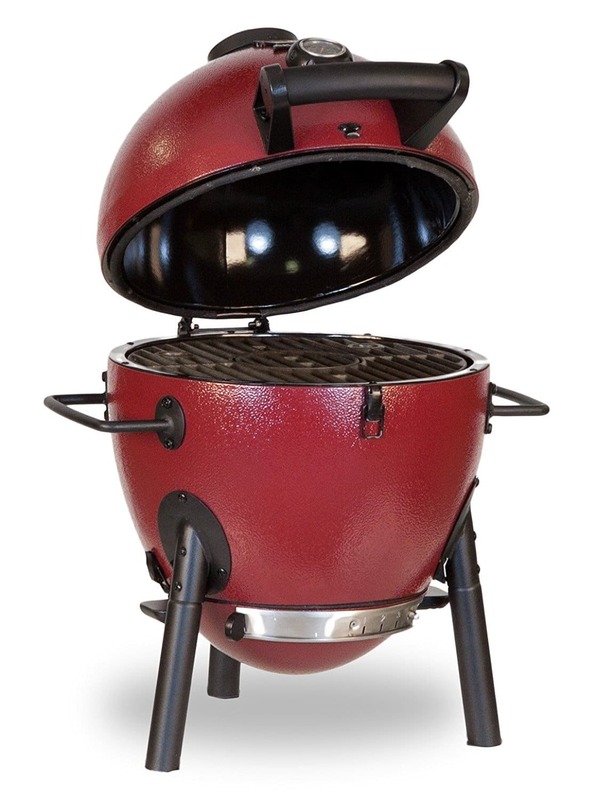 This impressive looking bbq from Char-Griller will remind you of a smoker with its unique shape and design. 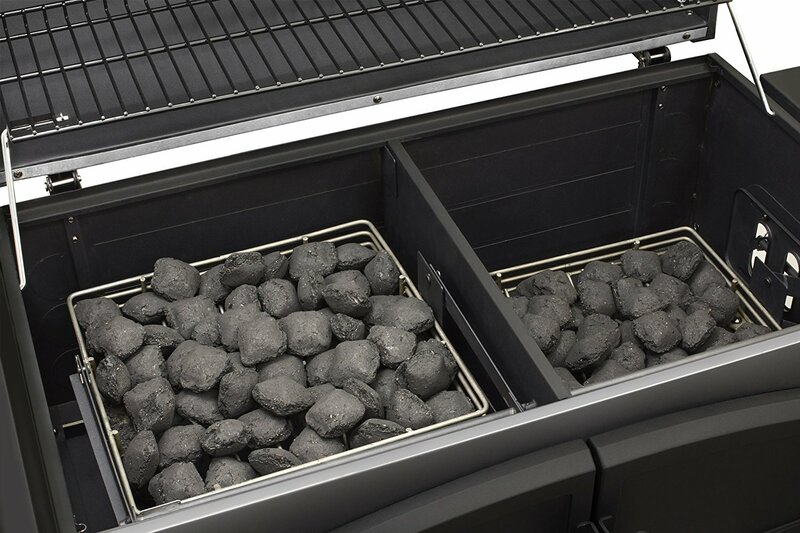 It features about 150 square inches of cooking surface, which is nearly half of the cooking surface of the other grills we’ve looked at; still though, it’s an excellent choice for taking trips to the park, going camping, or even using on your small apartment patio where traditional bbqs won’t fit. 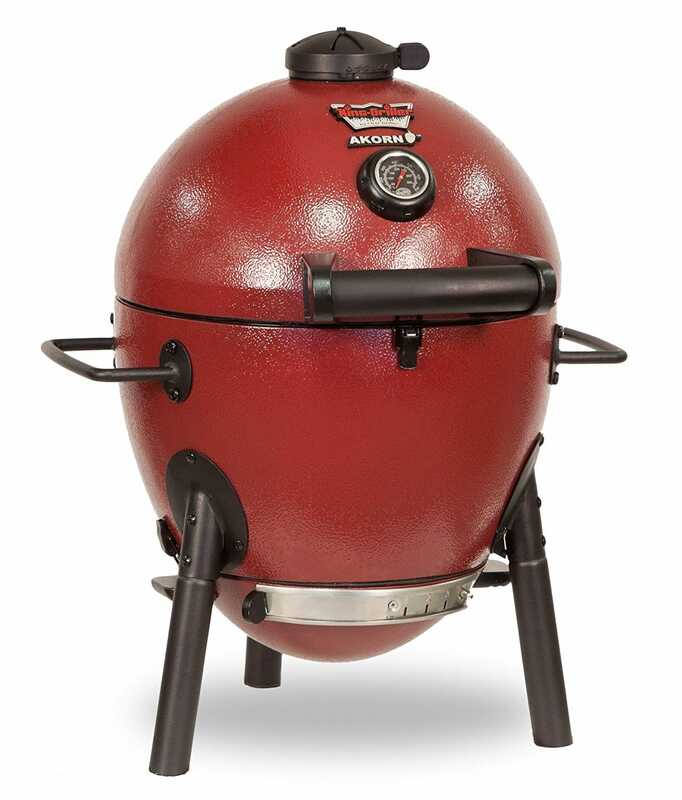 The unique style of grill, known as a Kamado, is designed that way to promote even cooking and produce greater flavor in the food you want to enjoy. It’s easy to clean and easy to use, and the dual air-flow dampers mean you have greater control over your cooking process so you can get those steaks just right. The unique design also means you have to use less charcoal to get the same result you might get from a much larger and less portable unit. The placement of the charcoal at the bottom of the unit means that there you will be able to do indirect-heat cooking, and if you use it correctly, you could smoke meats with ease. Of course, tending to the charcoal for hours could prove tedious, but if you were ambitious enough, it could be done. It does have recommended damper settings for smoking, but at very low temperatures. If you were going to attempt this, you’d want to be sure to read the instructions first. The easy to grip handles that make moving it a breeze. Throw it in the back of your pickup truck and take it to the game on Sunday afternoon. The pebbled ceramic brings back lots of memories of cooking on older style bbq’s with grandparents at the lake. The bright red color, as well as the other colors that are available, lend well to the pebbled ceramic look and makes you feel like you are king of the charcoal. 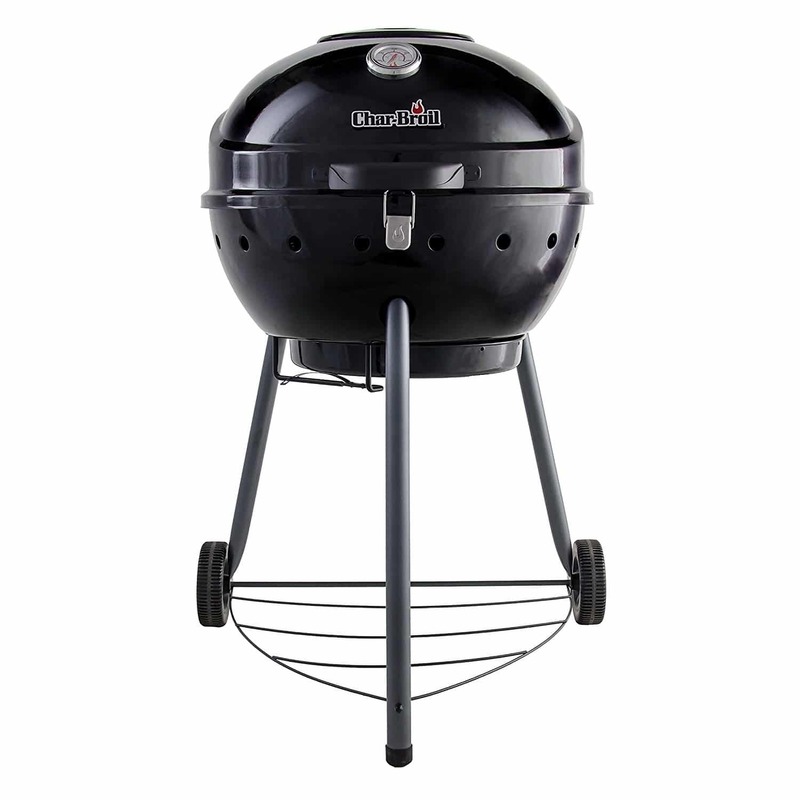 If you are looking for a smaller size charcoal bbq with smoking potential, this is the bbq for you. This is the biggest bbq on our list of the best charcoal grills. It has over 800 square inches of cooking surface and can easily cook for up to 30 people at once! That’s a whole lot of meat and vegetables grilling on the barbeque! 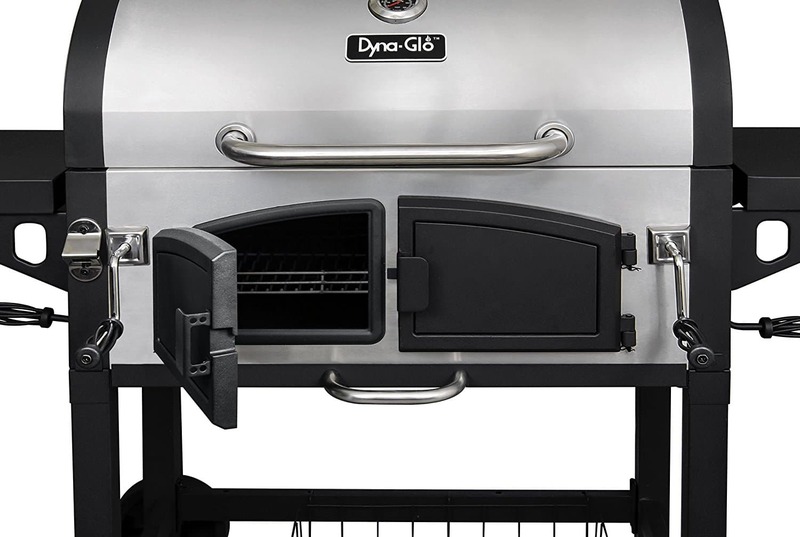 This large grill is brought to you by Dyna-Glo, and they are known for their superior attention to detail and quality. The charcoal basket adjustment trays allow you to control the amount of heat and change up your cooking options so that you can bring more delicious meals to the table to share with family and friends. The lid and body are made from stainless steel, and this looks like a more traditional grill that you would see in stores these days. That doesn’t mean that it doesn’t provide robust cooking power like some of the vintage units on this list. No sir, this is an excellent option for anyone who loves charcoal cooking, especially for large crowds. There is an adjustable smoke stack so you can take your charcoal grilling to the next level and smoke your own meat. There’s no reason to ever turn on your range or oven again. With the sizeable high-capacity ash catcher, you can remove any debris and old charcoal with ease. What’s better than a great performing grill? A great performing grill that is easy to clean. Dyna-Glo has put out a great product here, but there are a few downfalls. The first is that it is quite large and weighs over 120 pounds. That means once you put it in your backyard or on your patio, it’s likely going to stay there for a long time. Every other unit we’ve looked at is portable – at least in theory – but this big guy is meant to stand the test of time in one place. Moving it requires two people. The other downfall of this one is that if you aren’t feeding 20 or 30 people on a regular basis, or smoking your own meats, this isn’t a good option for you. It’s a lot of time and energy wasted to cook up a couple of hamburgers on a Friday night for you and your family. Otherwise, this is a performance powerhouse bbq that deserves a second look for big crowds of people. As you probably discovered after reading my best charcoal grill reviews, all grills are definitely not created equal. They all share some common elements and features, but when you’re ready to make an investment in a quality portable bbq that uses charcoal instead of propane, there are a few things you will want to look for and some things to avoid. Here is my condensed charcoal grill guide to help you get the perfect patio grill that you can enjoy for many years to come. What will you be cooking & how much? 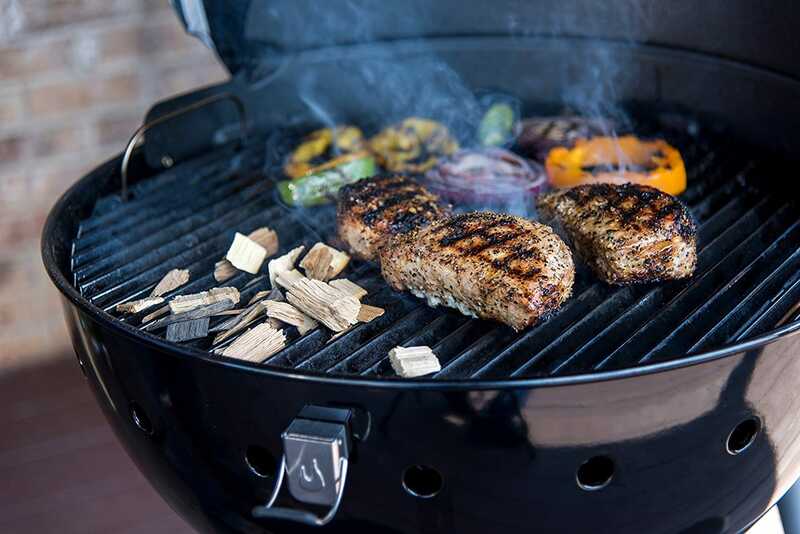 Before you purchase, make sure you get a charcoal bbq that can handle the food you will be grilling as well as the amount of food you will grill at any given time. If you plan on doing indirect cooking, make sure there’s enough room for the charcoal and some empty space to place your meats over. Also consider that you may be grilling vegetables and other items along with meat and fish. Get a grill with enough space for your needs. Grilling at the correct temperature is a must. Make sure you get a grill that has vents in the bottom and the top so you can keep the temperature regulated. Kamodo grills will let you adjust the placement of the charcoal so you can keep it closer or farther from the food for better control. The best charcoal grills will have solid internal and external construction that will last for years and years. Cheap grills won’t last, so spend a little more to get one with stainless steel and ceramic construction materials. You’ll have much better food and you won’t waste hundreds of dollars on a discounted grill that only lasts a couple of summers. One of the main downsides to grilling with charcoal over natural gas is the dirty factor. Charcoal isn’t clean, but you want your grill to be, so make sure you buy a bbq that has a simple charcoal clean out area. This may be in the form of a removable charcoal tray or a bottom door that lets you remove ashes with ease.